Save The Bees vs. Kill The Bees? Can you do a live removal? Why shouldn’t I call a beekeeper? No, they are not. You hear a lot about the bees disappearing and this is not the case. In fact, bees are actually thriving in Florida. CCD, or colony collapse disorder is regarded as a separate issue. 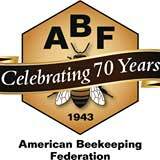 Saving the bees is an issue regarding CCD, Colony Collapse Disorder. Where beekeepers report that 40% or more of their managed bee colonies don’t survive the winter, or they abandon their boxed enclosure altogether. This is a problem that is currently being studied by experts around the world, and deserves more public attention. 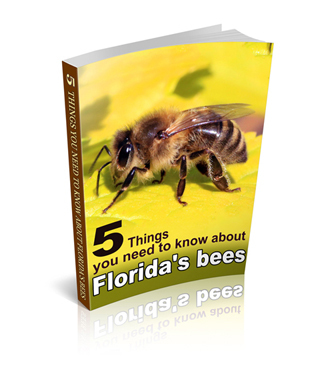 However, regarding bees in your backyard, since they may or may not be Africanized, we adhere to the State of Florida’s Department of Agriculture’s recommendations to completely eradicate the bees and their hive because of the dangers of Africanized bees, a.k.a. “KILLER BEES”. Africanized bees are bees that have been programmed by nature to defend their hive in a deadly attack. It’s in their genes. They are visually identical to the European bees, and only a dna test or aggression test can tell them apart. A typical bee colony will send 2 or 3 bees to defend its hive. An AFRICANIZED bee colony will send 2 or 3 thousand! They will follow you for up to 300 yards. If you are in a body of water, they will hover over you and wait for you to surface for air to continue their assault. They are attracted to carbon dioxide, so they will aim for your mouth and throat. In texas, an africanized bee colony even killed a horse! The autopsy showed the horse had 5 pounds of bees inside its lungs! These Killer Bees, really live up to their reputation. Africanized bee swarms are known to take over an existing beehive instead of starting a new one. They infiltrate an existing beehive, with no resistance whatsoever. They kill the existing queen, and integrate their own. Resistance is futile. Their queen will now mate and lay eggs. The emerging bees will now carry the Africanized gene, and within as little as one month. A beehive that has never bothered anyone for years, can suddenly become partially africanized, or fully africanized becoming a deadly time bomb. We can do a live removal however, it will cost the homeowner roughly 300% more because a live removal consists of hours of extra effort in finding the queen, the construction of the new hive enclosure and cone placements. Apart from acting against the recommendations of the State, the actual success rate of a live removal is only 20%. Furthermore, we will run the risk of doing a live removal on a bee colony that could potentially be partially or fully Africanized. It’s illegal for a beekeeper to remove a hive within a structure without a pest control certification. A beekeeper doesn’t have insurance, nor have a license. Plus, live removals only have a 20% success rate. Furthermore, we do not know if they are Africanized, or partially Africanized. It’s illegal to do live removals on Africanized bee hives. Hence, the State expects us to eradicate all bees and their hives on personal or public property. Yes, we absolutely give free estimates. You won’t ever have to worry about a surcharge or an expectant exuberant price. The quick answer is it depends. We have very competitive prices. Our prices start at $150.00 and can go up from there. Different factors determine the price of a bee removal. The size of the hive, the location of the hive, the level of difficulty of the removal, how high the hive is from the ground, and whether or not we determine if the hive is africanized. You will get a fully detailed estimate upon your free inspection, with no obligation to you, and we will be happy to do it. 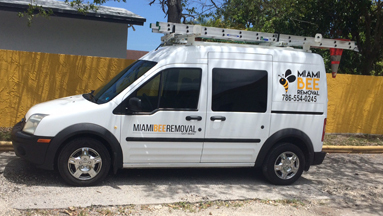 Yes, we guarantee all of our bee removal jobs so you can have the peace of mind that the bees will not return to your home. 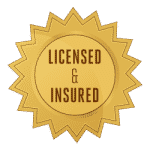 We are licensed and insured as well.